Small tropical tree 15feet (5m) grows near water, has reddish-purple cherry-like fruit. Small waxy white flowers, elliptical lance-like bushy foliage. Fruit is very acidic and extremely high in vitamin C- second only to the Australian plant Terminalia ferdinandiana. Also has ellagic acid, bioflavonoids, anthocyanins. One study published in the Journal of Cardiology compared male smokers who drank camu camu juice to those who took vitamin C tablets. Ingredients such as camu camu, maca roots, kiwichas, native potatoes, unique corn, cacao, coffee and many others are doing well, in line with what the producers want to achieve, without damaging their environments, family structures or the health of their communities. El cacao, el te de Matcha, la chlorella, el camu camu y el coco son cinco alimentos que te cuidan por dentro y por fuera. PTR products focus on a range of skincare needs, and the Camu Camu C Vitamin C Brightening Cleansing Powder (Dh165) is currently one of the hottest products on the market anywhere (powder cleansers are the of-the-moment way to clean your face, didn't you know? In addition to its classic options, WILD's portfolio also includes exotic kaffir lime, pink guava, guaran and camu camu flavours for consumers who want even more variety. Fusion developed packaging for the Camu Camu Power C X 30 Brightening Moisturizer. Lorzada appeared at a Duane Reade store in New York's Union Square to promote the product, which is made with such organic superfood items as maca, purple corn and camu camu, and promises such benefits as increased energy, weight loss and improved immunity protection. 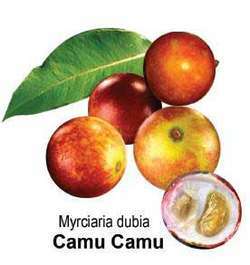 The powders also contain camu camu, a vitamin C rich super-fruit from the Amazon. Os valores encontrados de vitamina C para as polpas de camu camu foram relativamente altos se comparados a outras frutas. Traditionally found in the Amazonian rainforest, exotic dragon fruit and camu camu berries have been blended into the range to leave you feeling revitalised on your staycation. Radox has taken inspiration from Brazil to extract some of the most exotic ingredients, including dragon fruit and camu camu berries, expertly blended to leave you feeling revived, refreshed and renewed so you can start your day in true Brazilian fashion.